ABU DHABI, 6th November, 2018 (WAM) — His Highness Sheikh Mohamed bin Zayed Al Nahyan, Crown Prince of Abu Dhabi and Deputy Supreme Commander of the UAE Armed Forces, today made a tour of the A’l Bahar, a vibrant beachfront community located on the Abu Dhabi Corniche. H.H. Sheikh Mohamed was briefed on the main aspects of the 80,000-sqm mixed-use development which has a total of 44 dining, retail and leisure outlets in stylish units along a pristine length of beachfront, where Abu Dhabi visitors and residents can cool off and relax as well as have access to public spaces for concerts and community events throughout the year, with a 600-metre promenade, directly on the shores of the Arabian Gulf. 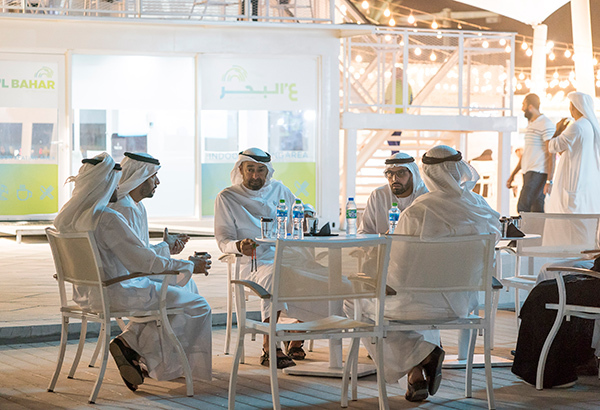 “Abu Dhabi’s growing interest in establishing recreational and tourist developments ideally fits within the emirate’s priorities to accelerate its sustainable development drive and underpin the future of this significant sector,” said H.H. Sheikh Mohamed, affirming that the UAE will determinedly forge ahead with driving the growth of the leisure sector to ensure the emirate will be a destination of choice for tourists coming in from different parts of the world. “The government will continue its plans to develop and boost the competitiveness of the tourism sector in line with Abu Dhabi Vision with regards to accelerating infrastructure investments as per best world standards,” the Abu Dhabi Crown Prince continued to say. During the tour, Sheikh Mohamed shook hands and exchanged cordial talk with a number of the site visitors who expressed delight at meeting him. 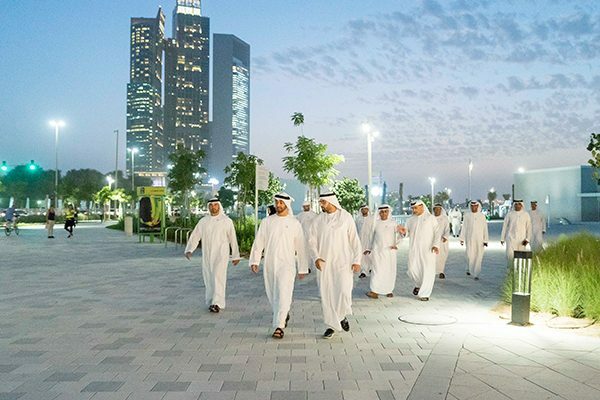 Mohamed Khalifa Al Mubarak, Chairman of Miral Asset Management- the project’s developer- said the development provides a unique experience for Abu Dhabi residents and visitors, describing it as a valuable addition to the family tourism magnets in the Emirate. Accompanying Sheikh Mohamed during the tour were H.H. Sheikh Theyab bin Mohamed bin Zayed Al Nahyan, Chairman of the Department of Transport, Reem bint Ibrahim Al Hashemy, Minister of State for International Cooperation, and a number of top officials.